What wasn’t expected was Apple’s announcement 4k titles would cost the same as HD, which are typically $14.99 to $19.99 for new releases. UHD titles are sold for $29.99 at Google Play, Microsoft Video, Vudu and other services. Apple also surprised us with a promise to upgrade any previously purchased HD titles (if eligible) to 4k at no extra charge. This might shift some consumers to purchase or redeem digital content from iTunes given the easy and more affordable option. So what’s different about the new Apple TV 4k itself? It’s certainly not design. If you put the two models together you wouldn’t be able to tell which is the newer one. But, there’s a lot going on internally that brings Apple TV up to speed with its competitors like Fire TV and Roku. Let’s break down the most critical new upgrades. This is the most noticeable and critical upgrade for the Apple TV 4k. The streaming player now supports video delivered at 2160p, with 4-times the resolution of it’s predecessor streaming in maximum 1080p. What’s more, the Apple TV 4k supports HDR content, that is, video that includes a special data stream expanding its color depth. The player can translate both HDR10 (the open standard) and Dolby Vision (a propriety technology). The Apple TV 4k has a more powerful quad-core A10X Fusion chip over the dual-core 4th-generation A8 chip found in its predecessor, however, both are built with 64-bit architecture. The 5th-generation Apple 4k TV expands the bandwidth possibilities by adding Gigabit Ethernet support. And, the Apple TV includes support for simultaneous dual band (2.4GHz and 5GHz) Wi-Fi. Both Apple TVs still support Wi-Fi (802.11a/b/g/n/ac). Bluetooth has been upgraded from 4.0 to 5.0 which can double speeds of transfers. iPhone 8, 8 Plus and iPhone X will also support Bluetooth 5.0 upon release. HDMI should have been upgraded in the 4th-generation model, but Apple was sleeping on this one. The Apple TV 4k needed to upgrade to 2.0a in order to support 4k with High Dynamic Range. 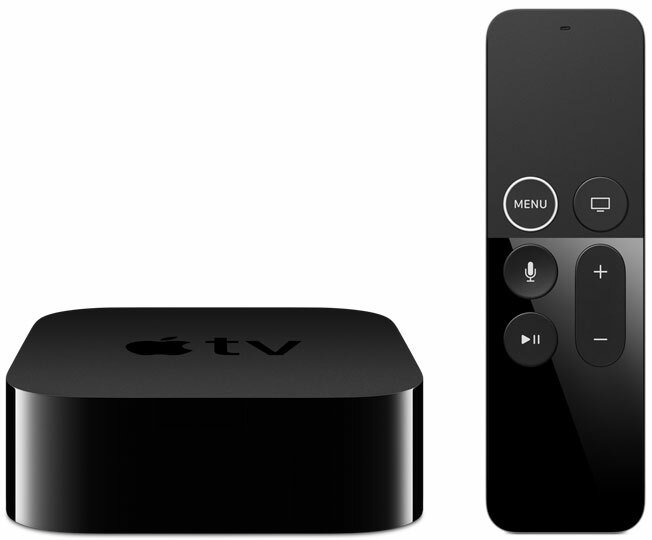 Upon shipping Apple TV 4k will include tvOS 11, the newest version of Apple’s operating system for Apple TV. The new tvOS will feature Home screen sync, AirPods support, auto dark and light mode, and AirPlay 2 among other features. Storage is staying the same as the last two configurations available: 32GB or 64GB. However, from details found in the latest tvOS it appears the Apple TV 4k increases the RAM to 3GB from 2GB. It’s interesting Apple decided not to simply double the RAM to 4GB, but given Apple TV and other streaming media players only run one channel at a time there must be no need for more floating memory. The new Apple TV 4k is priced slightly higher than the last generation. The 32GB model has an MSRP of $179 ($20 more than the previous model), while the 64GB model costs $199. Apple TV 4k will be available starting Sept. 22, 2017. Will you be buying one? Be sure to see our Apple TV 4k vs. Apple TV spec comparison. And, read more Apple News on our dedicated channel!